Rice husk is a form of agricultural biomass that provides an abundant silicon source. Rice husks are widely burnt in agricultural fields in India because it is difficult to find other uses for them. Farmer’s burn rice hulls usually under incomplete combustion conditions to avoid accidental fires. The objective of this study was to develop a new method of amorphous silica was prepared from rice husk ash by sol-gel method. Initially received from Rice husk ash was calcined at 400°C, 500°C, 600°C and 700°C for 5 hrs to remove the volatiles in the sample and determine the amorphous structure of SiO2. Next, the thermally treated RHA was mixed with alkali solution to produce sodium silicate solution and precipitated silica was produced by the neutralization of sodium silicate solution. Rice Husks soaked in nitric acid produced the maximum amount of the sodium silicate solution and precipitated silica. Sodium oxide (Na2O) content and silica (SiO2) content in the sodium silicate solution were also determined. Extracted precipitated silica particles were characterized by Fourier transform infrared (FTIR), X-Ray diffraction and Optical microscopy techniques. The chemical composition of silica was confirmed by FTIR and SEM with EDX. Highly pure amorphous silica was derived from rice husk ash was confirmed by XRD pattern. The morphology of the obtained materials was analyzed by SEM. At optimized conditions, nano sized highly pure silica was produced with a high reactivity and 99.9% amorphous in form. This economic technology as applied to waste material also provides many benefits to the local agro industry. Thus this paper may be providing a low cost and simple method to prepare functional materials. Rice culture stands by the production and refined area, playing a strategic role in the world frugality . The agricultural by product include rice straw, rice husk and plant materials etc., of all these by products, rice husk (RH) may be considered as suitable energy and silica a contrivance is Asian countries. The main purpose for chosen rice husk is due to its granular structure, chemical stability and its local availability at very low cost [2,3]. The chemical composition of rice husk varies from sample to sample connected to the type of paddy, year, crop, change of climate and geographical condition . In terms of properties they have a very nature, low bulk density (below 150 Kg/m3), low water and moisture permeability, low value of equilibrium moisture content (below 10% at an air relative humidity (RH) of 60%), low value of the coefficient of the temperature conductivity (below 0.036 W.m-1.k-1), high resistance to the action of harmful fungi, good anticorrosion properties of steel, aluminium and copper. Many methods have been developed to produce pure silica from rice husk ash in low cost. By heating higher temperatures, the unburned carbon can be removed from the ash but this leads to the crystallization of the ash from amorphous silica into tridymite or cristobalite. At lower temperatures, the amorphous nature of rice husk ash (RHA) silica will be happened. Under the complete combustion, the colour of the ash is grey/white but in partially burning condition a black colour ash is occurred. In some areas, a huge amount of rice husk ash is used as waste and disposed land fill site, which leads to air and water pollution. The air bone particles have been related to respiratory disease in humans. If not only avoids environment pollution combustion of rice husk, but also produces enormous economic benefits [5-7]. The calcinations temperature and time are two important deputies to define whether the silica in the rice husk ash amorphous is become crystalline. Some studies have been performed the amorphous silica from rice husk, found that the temperature 400- 700°C is the appropriate by reviewing literatures . The rice husk ash(RHA) make may certain several metallic impurities like Fe, Mn, Na, Ca, K… etc., can decrease its surface area and purity. If these elements can be made good use to residue problems would be cleared, and at the same time great profits could be gained. In most applications, rice husk ash is more favourable compared to rice husk. The silica in the ash undergoes structural transformation depending on the conditions (time, temperature, chemical composition, minerals content) of combustion. At 400- 1200°C amorphous ash is formed and at temperature greater than the crystalline ash is formed . In the present study to extract active amorphous silica obtained from rice husk either via complete composition or by solvent extraction. It may be concluded that amorphous silica of rice husk ash can be used for different novel applications. This amorphous silica has a promising future as a biomaterial because it originates from biomass . Silica based materials are frequently used for different bio applications due to their good bioactivity and biodegradability characteristics. Among chemicals used in this study include HCl, NaOH and H2SO4. All chemicals were used as received without any purification. Initially, locally collected rice husk waste was cleaned by distilled water to remove the dirt and then dried at 24 hr. An appropriate amount of cleaned sample was calcined at 400°C, 500°C, 600°C and 700°C for 5 hr (Table 1). Table 1: Properties of rice husk. XRD studies: X-ray diffraction experiments of rice husk ash were performed with a Rigaku miniflex diffractometer for 2θ values from 10° to 90° using Cukα target at wavelength of λ = 1.5406 A0. Infrared spectroscopy (FT- IR): The obtained materials from the burnt rice husk were characterized in a Perkin Elmer Spectrum 1000 spectrometer. In the wave number range from 4000-400 Cm-1 at a resolution 4 Cm-1 using 64 scans using KBR powder as reference. Typically, samples between 10-40 mg used. Morphology studies (sem): Our samples were characterized by scanning electron microscopy (SEM) (Jeol-JSM-6360LV) at a voltage 20 kv and previously coated with gold under vacuum by sputtering using a BAL-TEC’S apparatus. Secondary electron images were obtained. Treated rice husk ash TGA and DTA analysis were performed in thermo gravimetric equipment (Pyris7, Perkin-Elmer) to verify the mass loss behaviour of rice husk and the effect of the chemical treatments, as well as their activation energies from the application of the Ozawa method. TGA were carried out with 10-60 mg rice husk samples in platinum pan in air atmosphere under 10-20°C min-1 heat rate providing the percentage composition of volatiles, organic compounds and the residue created by the rice husk burning. The proposed method consists of the following stages. Rice husk (RH) and dilute HNO3 were mingled into a 500 ml two necked flask. The suspension was boiled for 5 h under reflux condenser, and vigorous stirring was applied during the whole reaction processes. Finally, the suspension was filtered, and solid residue was washed throughouly with deionised water to ensure the absence of NO3 - and subsequently dried in an oven at 155°C for 48 h.
The dried rice husk then was taken in crucible and placed it in electrical furnace for 5 h at 400°C to get a black ash. The ash then was ground into powder and later heated again at 600°C 5 h complete combustion. Pure amorphous white silica was obtained by burning this rice husk at 800°C in a muffle furnace for 5 h. Finally produce the rice husk silica (RHS). A schematic flow chart for preparation of silica gel particles from rice husk ash is proposed as shown in Figure 1 rice husk ash was mixed with 250 ml of 1 N sodium hydroxide aqueous solution. The mixture was refluxed for 3 h at 110°C. The solution was filtered and stored in a refrigerator for further usage. 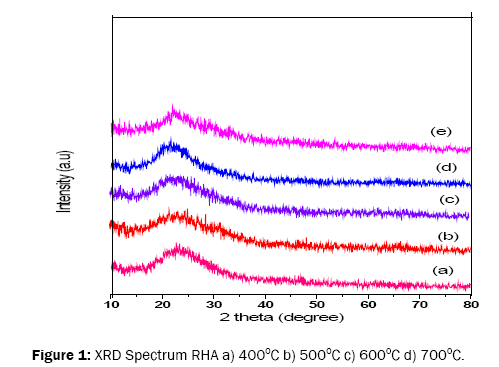 Figure 1: XRD Spectrum RHA a) 400°C b) 500°C c) 600°C d) 700°C. A 5 ml sample of sodium silicate solution was taken from the stock solution and poured into 15 ml distilled water at a time and stirred for a specific time. The PH of the solution was adjusted to 10-12 by drop wise addition of hydrochloric acid under stirring speed to form silica gel. The time want for gelation is approximately within five minutes after sol solution was neutralized. Agitation was continued for another one hour to obtain wet gel nano particles. The prepared gel was aged at 800°C for 3 h under finalized condition. Distilled water, NaCl and other impurities were separated from the gel by solvent exchange with dilute and pure methanol in 4-5 times. The dilute methanol (75%) was used to avoid any structural shrinkage during the solvent exchange. Completely, methanol exchange was done six times and aged at 800°C. The total time of aging was 52 h. The wet gels were then dried. At a lower silicate concentration and with the PH less than 8, Si(OH)4 is the dominant species in its aqueous solution. At higher concentrations, the silanols, the Si(OH) groups, spontaneously polymerize to yield higher oligomers linked by a disiloxy bond. Such a reaction is most favourable when one of the silanols is deprotonated to a Si- O- group . These oligomers grow into colloid-sized silica particles in which larger particles grow at the expense of smaller ones. At higher PH (greater than 8), however, the much more concentrated silicate solution is stable. This is because disiloxy bond undergo nucleophilic attacks by OH-via a five coordinated intermediate (Scheme 1). Scheme 1: Schematic diagram of preparation of rice husk ash to silica gel. The RH powder was combusted under different conditions, including varying amounts of the husk powder combustion temperature and soaking times . Different colour changes were observed and the results are shown in Table 2. Table 2: Combustion temperature and soaking duration for dry rice husk powder. The physical appearance of untreated rice husk was seen to be brownish before pre treatment. After pre-treatment, it was seen to be light yellowish colour due to the concentration of acid added to the husk. The light yellowish colour indicates that the pre-treatment of the rice husk has increased the surface area of the rice husk after treatment. Burning out temperature and time are the two important factors to define whether silica remains amorphous, as in RHA, or become crystalline. It has been found that reheating the ash to remove carbon residues takes a relatively long period of time and temperatures, with the consequent effect that silica is converted into crystalline forms . This behaviour was not evidenced along the burning cycles here applied. The experimental work has different parameters that affect quantity and quality of silica produced. The quality of silica produced mainly depends mainly on the precipitation conditions . Studies were carried out by the varying process parameters such as temperature, concentrated HNO3 solution used for the digestion. b) Silica yield increased marginally with increase in concentration caustic (at same caustic to ash ratio). It was observed that as the caustic to ash ratio increases the yield increases up to a ratio of 1:3 after which the yield decreases . The X- ray spectroscopy of the rice husk ash is shown in Figure 1. It is important to prepare high purity SiO2 ashes with amorphous structures from rice husk, because IARC (International Agency for Research on Cancer) one part of WHO (World Health Organisation), strongly points that the crystal SiO2 have carcinogenic risk to humans . The structure of RHA strongly depends on the burning temperature and time. There are no sharp peaks. A strong peak is observed at about 23° 2θ angle. This generally indicates that the solid is either not crystalline (or) it consists of micro crystalline structures. No peak at region of around 23° confirms absence of crystalline quartz or cristobalite. The other X-rays diffract grams showed semi crystalline and crystalline phase of silica for combustion at varying temperatures are 400°C, 500°C, 600°C and 700°C shows that amorphous substances display an atomic arrangement that is either random (or) has a very short range in order .The existence of several sharp peaks indicates the presence of crystalline phase in the matrix. Crystallization had taken place due to the high temperature employed during calcination. FTIR spectroscopic tool is used to identify the key functional groups indicating structural changes in the samples (Figure 2). A broad band in the range of 3670-3000 cm-1 responsible for the isolated and surface -OH groups of -Si-OH whereas the band at 1630 cm-1 assigned to the bending mode (HOH) of coordinated water . The results indicates that the intensity of these peaks is decreased after calcination whereas is increased after silica extraction. The predominant absorbance peak between 1200 and 1050 cm-1 is associated with the Si-O-Si asymmetric band stretching vibration and the corresponding symmetric stretch at ~802 cm-1 . The intense peak in the range of 470-450 cm-1 is attributed to the Si-O asymmetric bending vibration of Si-O-Si bond. After thermal activation and silica extraction, the intensity of all these peaks is shifted towards higher wave number  AS is exhibited a relatively strong peak at about 817 cm-1 and it can be distinguished from the band of crystalline silicate . The presence of more pronounced Si-O-Si bending vibrations at 473 cm-1 confirms the highly condensed silica network in Amorphous Silica spectra. No peak was found between 2800 and 3000 Cm-1. It means that there were no original organic compounds in the silica after controlled combustion and extraction. Figure 2: FTIR Spectrum for RHA a) 400°C b) 500°C c) 600°C d) 700°C. The organic compounds content was in the range of 75- 84 % (depending on the rice husk variety and chemical treatment), which is constituent with the literature. This phenomenon can be explained on the basis of the thermal decomposition behaviour of its major organics constituents (Figure 3). In TG curves the weight loss observed up to 100°C is attributed to evaporation of physically absorbed water and perhaps the remaining ethanol. The next weight loss occurred at 102 to 600°C which was related to evaporation of water formed from poly condensation reactions and removal of organic groups by oxidation reaction. The first stage of thermal decomposition is the loss of volatile compounds followed by the decomposition of the cellulose and lignin to the intermediate, which may be an organic material of smaller molecular weight. In the second stage, there is no peak was observed. Hemicelluloses decomposes between 200°C to 260°C, while the cellulose between 250°C to 360°C, and lignin from 280°C to 360°C [22-26], it was not possible to separate the degradation process of rice husk components due to the complexity reaction and the superposition of the degradation peaks. 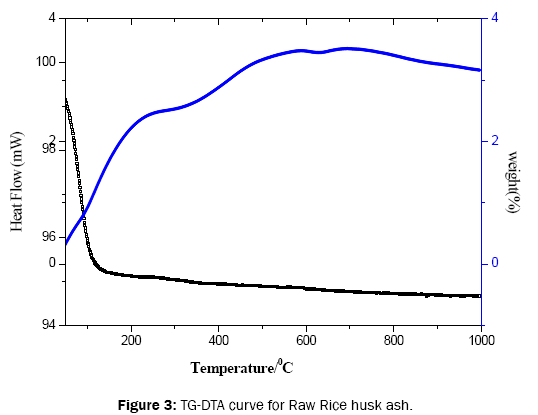 Figure 3: TG-DTA curve for Raw Rice husk ash. Figure 4a and 4b show the SEM and EDS analysis of corn cob ash at 700°C. In the SEM image, corn cob ash particles are polygonal shape and the strong intensity of Si in the EDS spectrum is confirmed the silica at higher weight percentage and also due to some trace of other impurities. Figure 4: (a) SEM image of RHA and (b) EDS spectrum of RHA at 700°C for 5 hr. This study revealed the process for extraction of silica from Rice husk and also transition metal doped rice husk silica nano particles was synthesized via sol-gel method under mild conditions. Effect of two main parameters (heating temperature and heating hours) on the formation of black and white particles in rice husk silica ash was also studied. All existing techniques for obtaining silica are primarily operated at temperatures of around 1000°C while this process used in this work has been made possible in the temperature varying from 400 to 700°C. However, at low temperature (400°C) the oxidation of carbon in the acid treated rice husk is sluggish. Rice husk is a potential green resource. This proves to highly energy effective and also a useful technique for waste disposal and utilization. Sun L. Silicon-Based Materials from Rice Husks and Their Applications. Ind. Eng. Chem. Res. 2001;40:5861-5877. Zhang HX, et al. A study on the consecutive preparation of d-xylose and pure superfine silica from rice husk.Bioresour. Technol. 2010;101:1263-1267. Kalapathy U, et al. A simple method for production of pure silica from rice hull ash.Bioresour. Technol. 2000;73:257-262. Della VP,et al. Rice husk ash as an alternate source for active silica production. Mater. Lett. 2002;57:818-821. Watari J, et al. Fabrication of porous SiO2/C composite from rice husks. Journal of the European Ceramic Society.2006;26:797-801. Conradt R, et al. Nano-structured silica from rice husk. Journal of Non-Crystalline Solids. 1992;145:75-79. Park BD, et al. Characterization of anatomical features and silica distribution in rice husk using microscopic and micro-analytical techniques. Biomass and Bioenergy.2003;25:319-327. Ayhan, Demirbas. A discussion of the paper “Study on the pozzolanic properties of rice husk ash by hydrochloric acid pre-treatment” by Q. Feng, H. Yamamichi, M. Shoya, S. Sugita. Cement and Concrete Research.2005;35:10-17. James J and Rao MS. Silica from rice husk through thermal decomposition.ThermochimicaActa. 1986;97:329-336. PayaÂ J, et al. Determination of amorphous silica in rice husk ash by a rapid analytical method. Cement and Concrete Research.2001;31:227-231. Adam F, et al. Silver modified porous silica from rice husk and its catalytic potential. J. Porous Mater. 2008;15:433-444. Agren P, et al. A light and X-ray scattering study of the acid catalyzed silica synthesis in the presence of polyethylene glycol. J. Non-Cryst. Solids. 2000;261:195-203. Nakata Y, et al. Preparation and properties of SiO2 from rice hulls. Nippon SeramikkusuKyokaiGaku- jutsuRonbunshi. 1989;97:842-849. Hana® S, et al.Surface properties of silicas produced by thermal treatment of rice-husk ash. ThermochimicaActa. 1980;37:137-143. Ibrahim DM, et al. Study of rice husk ash silica by infrared spectroscopy. Thermo- chimicaActa. 1980;37:307-314. Krishnarao RV.Formation of SiC whiskers from rice husk silica and carbon black mixture: effect of preheat treatment. J. Mater. Sci. Lett. 1993;12:1268-1271. Concha R, et al. Preparation of silica from rice husks. J. Am. Ceram. Soc. 1996;79:2012-2016. Ang TN, et al. Pre-treatment of rice husks for fungal fermentation. Int J Chem Eng. 2009;2:197-202. Ang TN, et al. Efficiency of ionic liquids in the dissolution of rice husk. BioResources. 2011;6:4790-4800. Shu-ting L, et al. Electromagnetic performance of rice husk ash. Bioresources. 2014;9:2328-2340. Alvarey V andVazquee A. Thermal degradation of cellulose derivatives stratch blends & sisal fibre biocomposites.polym.Degrad. stab. 2004;84:13-21. Umeda J andKondon k.Process optimization to prepare high purity amorphous silica from rice husks via citiric acid leaching treatment. Transactions of JWRI. 2008;37:13-17. Subbukrishna DN, et al. Precipitated silica from Rice husk ash by IPSIT process. 15th European Biomass Conference & Exhibition. 2011;7-11. Nayak JP and Bera J. Preparation of an efficient humidity indicating silica gel from rice husk ash. Bull. Mater. Sci.2011;34:1683-1687. Kalapathy U, et al. An improved method for production of silica from rice hull ash.Bioresource Technology. 2002;85:285-289. Farook A, et al. The Synthesis and Characterization of Cobalt-Rice Husk Silica Nanoparticles. The Open Colloid Science Journal. 2011;4:12-18.